Join us on a 2-hour Malibu Stars' Homes Tour where you will see up close the impressive homes of popular stars from TV and Film. Malibu is a stunning beach destination where you'll get an up-close and personal look at over 40 stars homes belonging to some of the biggest names in the business! Cliff side mansions and private bungalows overlooking the Pacific provide insight to the California lifestyle enjoyed by the lucky few who call this their home. Discover the beauty of Malibu and see the stunning homes of some of your favorite stars with our Los Angeles celebrity tours. 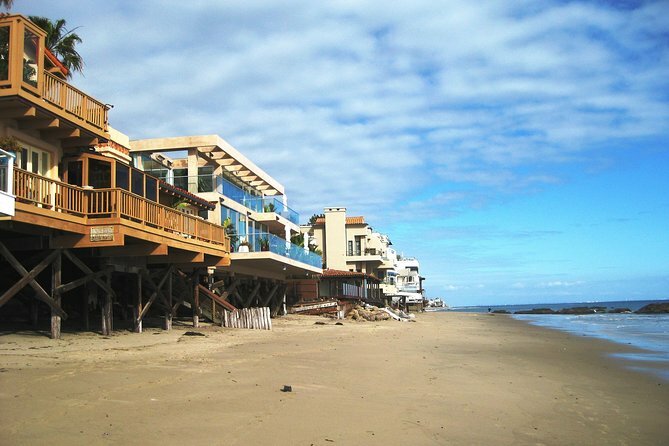 Malibu is one of the most exclusive communities in the greater Los Angeles area. Famed for its historic coastline that spans 27 breathtaking miles from Tuna Canyon to Point Mugu in Ventura County, Malibu is among the wealthiest parts of the city. Its relative isolation and stunning ocean views have made it a longtime favorite of movie stars, celebrities, and powerful entertainment industry icons. Visitors to Los Angeles often find Malibu one of the most fascinating destinations in the area, and this Malibu Stars Homes tour is put together to give you an up-close-and-personal glimpse into the extravagant lifestyle of world-famous celebrities. During your outing, you will visit the current and former homes of more than 40 stars, including some of the biggest names in movie history. Further highlights of the Malibu Stars Homes tour include a stop at Malibu Pier, access to Malibu Beach, and a blissful cruise along the beautiful Pacific Coast Highway. You’ll also have incredible ocean views, photo opportunities, and much more. Some of the Malibu homes you’ll see are currently or formerly owned by celebrities including Leonardo DiCaprio, Bruce Willis, Cher, Burt Reynolds, Courteney Cox, Adam Sandler, and Bill Murray, among many others. Available year-round, the Malibu Stars Homes tour also includes a stop at the Getty Villa, a Malibu institution where some of the world’s rarest and most prized artistic and historic treasures are on display.